March 31st has an interesting collection of anniversaries. On March 31st in 1732 composer Franz Joseph Haydn was born. I remember going to visit his birthplace when I was ten years old and then hearing some of his music performed in Vienna. It was a wonderful opportunity to get a sense of what Haydn's world was like. To this day I still love his music, in particular the The Farewell Symphony. I have reviewed a wonderful book about this piece of music here on Through the Looking Glass Book Review. You can hear part of the symphony below as performed in 2009 by the Youth Artists Symphony. The next anniversary of note is the birthday of Cesar Chavez, the labor leader who changed the lives of countless farm workers in America. You can see the books I have reviewed about Chavez here. Last but by no means least, on this day in 1889 the Eiffel Tower was completed. I have reviewed an excellent book about this much loved piece of architecture here on the Through the Looking Glass Website. This wonderful has come to epitomize France and many people cannot think of France or Paris without thinking almost immediately of the Eiffel Tower. You can view the books I have reviewed about Passover on the Through the Looking Glass Passover feature page. I read the book reviewed below many years ago, and yet I still remember it with great fondness. Reading the book reminded me that women have brought about change in many ways. Some have done so in big ways that made them front page news, like Amelia Earhart example. Then there are those women who have brought about change in big but quiet ways, like Fannie Farmer. I grew up with a Fannie Farmer cookbook and made my first very flat cake (I forgot to put in something vital) using one of her recipes. I know that when my daughter is ready is strike out on her own, I will give her (among other things) a set of basic tools in a tool box, a sewing kit, some wonderful fabrics for making cushions and curtains, a set of Jane Austen novels, and a Fannie Farmer cookbook. Marcia is most annoyed. Her mother has told her that they are getting a new cook, someone who will be “mother’s helper.” Why should they need such a person when Marcia herself is her mother’s helper? Marcia sincerely hopes, therefore, that the new cook, Fannie Farmer, is going to be terrible. No such luck though. Fannie is an excellent cook, and she is soon teaching Marci some of her kitchen wisdom. It must be noted however that Marci does not always succeed in her culinary exploits and there are some food disasters which Fannie has to help her sort out. Not surprisingly Marcia finds herself getting very fond of Fannie, and since her mother is so busy with the new baby, the little girl spends a lot of time in the kitchen, watching and learning. Marcia wishes very much that she knew all of the wonderful cooking secrets that lie in Fannie’s head. When she tells Fannie this, the red-headed cooking wonder comes up with the idea of writing down all the things she knows in a book; the secrets, the tips, the recipes. Soon word gets around about the book that Fannie has created, and everyone wants to use it, not just Marcia. It would seem that Fannie Farmer has something very special to offer the world. Deborah Hopkinson has created a delicious story about a woman who changed the way thousands of women cook. Fannie made it possible for just about anyone to learn how to cook by developing the first real recipes with exact measurements of ingredients. Her book is still widely used today by cooks of all ages. At the back of the book the author gives us a more detailed biography of Fannie and she includes one of Fannie’s famous recipes. With great creativity the illustrator combines eighteenth century engravings and her own pen and ink and watercolor illustrations to create one of a kind artwork that gives the reader a sense of the times and that is visually intriguing and unique. On this day in 1874 a very singular person came into the world. 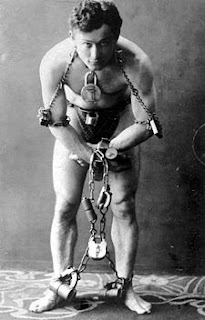 His name was Erik Weiss, but when he was a young man he took on a different name, a name that he felt would better suit his career as a performer; he called himself Harry Houdini. Houdini began his career as a magician, but he soon focused his energies on developing exciting escape acts. He broke out of handcuffs, jumped off bridges with chains wrapped around him, and he was even able to escape from a milk can full of water. No one knew how he did these amazing feats, and he was soon famous all around the world. I have reviewed a selection of books about Houdini, which you can view here on the TLLG website. I particularly liked The Houdini Box by Brian Selznick. In this title, Selznick beautifully combines fact and fiction to give readers a story that is both fascinating and thought provoking. For young readers who like a good mystery there are the Houdini and Nate Mysteries. In these titles, a young boy - with Harry Houdini's help - solves some thrilling and often dangerous mysteries. Bologna, Italy...The Hans Christian Andersen Award Jury of the International Board on Books for Young People (IBBY), has announced thatDavid Almond, from the United Kingdom is the winner of the 2010 Hans Christian Andersen Author Award and that Jutta Bauer, from Germany is the winner of the 2010 Hans Christian Andersen Illustrator Award. The announcement was made at the Bologna International Children's Book Fair, and the Andersen medals and diplomas will be presented to the winners on Saturday, 11 September 2010 at the international IBBY congress in Santiago de Compostela, Spain. The Hans Christian Andersen Award is the highest international recognition given to an author and an illustrator of children's books. In awarding the 2010 Hans Christian Andersen Medal for writing to David Almond, the jury has recognized the unique voice of a creator of magic realism for children. Almond captures his young readers' imagination and motivates them to read, think and be critical. His use of language is sophisticated and reaches across the ages. David Almond was selected from 28 authors for the award. The four finalists were: Ahmad Reza Ahmadi from Iran, Bartolomeu Campos de Queiros from Brazil, Lennart Hellsing from Sweden and Louis Jensen from Denmark. Jutta Bauer was selected from 27 illustrators nominated. The four finalists were Carll Cneut from Belgium, Etienne Delessert from Switzerland, Svjetlan Junakovic from Croatia and Roger Mello from Brazil. The full list of candidates can be read at www.ibby.org. The ten members of the 2010 Jury, led by Jury President Zohreh Ghaeni from Iran, met in Basel, Switzerland on 13 and 14 March 2010. The Jury of children's literature experts comprised Ernest Bond (USA), Karen Coeman (Mexico), Nadia El Kholy (Egypt), Maria Jesus Gil (Spain), Jan Hansson (Sweden), Annemie Leysen (Belgium), Darja Mazi-Leskovar (Slovenia), Alicia Salvi (Argentina), Helene Schar (Switzerland) and Regina Zilberman (Brazil). Elda Nogueira from Brazil representing IBBY and Liz Page as Jury Secretary attended the meeting ex officio. The Hans Christian Andersen Award is considered the most prestigious in international children's literature, is given biennially by IBBY to a living author and illustrator whose complete works are judged to have made lasting contributions to children's literature. Her Majesty Queen Margrethe II of Denmark is the Patron of the Andersen Awards. The Author's Award has been given since 1956 and the Illustrator's Award since 1966. Nami Island Inc. is the sponsor of the Hans Christian Andersen Awards. Information, including a history of the awards is available at www.ibby.org. March 23, Bologna, Italy...The International Board on Books for Young People (IBBY) today announced the winners of the 2010 IBBY-Asahi Reading Promotion Awards. This is the 20th Anniversary of the award given by IBBY and the Asahi Shimbun newspaper company for international projects run by groups or institutions judged to be making a lasting contribution to reading for young people. The Award is given every other year to two organizations. The 2010 winners are The Osu Children's Library Fund, Ghana, http://www.osuchildrenslibraryfun d.ca, and Convenio de Cooperacion al Plan de Lectura, Medellin, Colombia, http://bit.ly/9kSlvg. Each will receive $10,000 US, which will be presented at the 32nd IBBY Congress in Santiago de Compostela, Spain, at a special event on September 10th. The Osu Children's Library Fund (OCLF) consists of two teams one in Canada and the other in Africa--that share the mission of bringing books and literacy skills to African children and adults. OCLF works at the grassroots level, seeking support and participation of elders and members of the host community. Convenio de Cooperacion al Plan de Lectura is a non-profit organization that encourages reading and literary creation by means of awareness, training and research programs, including workshops, storytelling and sessions with authors and illustrators. Members of the 2010 jury are Jury President Hannelore Daubert (Germany), Anastasia Arkhipova (Russia), Nikki Gamble (Great Britain), Jehan Helou (Palestine), Ahmad Redza Khairuddin (Malaysia) and James Tumusiime (Uganda). The International Board on Books for Young People, www.ibby.org, is a non-profit organization which represents an international network of people from all over the world committed to bringing books and children together. March is Youth Art Month, and in honor of this I am reviewing a number of titles about art, artists, and art history. Today I have a review of a book that quite frankly blew me away. This is one of those picture books that will resonate with adults as well as children. I recently started drawing with pen and ink and am now adding color to my pictures, so I found this book particularly pertinent to my art journey. Some people think that an artist is simply someone who can paint, or draw, or sculpt; that an artist is someone who creates. This is true of course, but an artist is also someone who sees the little things that many of us miss. An artist sees the big picture when the rest of us are too busy to notice what is going on around us. An artist is someone who can imagine and think outside the box. In this gorgeous and thought provoking book the author’s simple lyrical words and the illustrator’s beautiful illustrations combine to show readers of all ages that being an artist is about observing, exploring, using your imagination, and letting yourself enjoy each moment to the fullest. In a world where so much emphasis is placed on finishing a project, this book embraces the whole art making experience, highlighting the fact that being an artist is not just about the doing, but it is also about experiencing the doing. Please consider purchasing this book through this blog to help support our work. You can do this by using the Amazon box to the left of this post. Starting today, children and families can sing along with creatures of the Indian jungle in a free animated video of The Animal Boogie. One of Barefoot Books’ bestselling books, with more than a million copies sold, The Animal Boogie introduces children to the creatures of the Indian jungle with an adaptation of a popular playground song. The book has garnered many awards and has received praise for the inclusive way in which it speaks to children with disabilities. 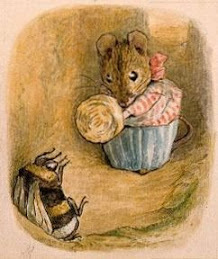 The Animal Boogie, illustrated by Debbie Harter, whose endearing pictures also appear in the popular Barefoot Books Bear series, was first published by Barefoot Books in 2000. It has become a classroom favorite, used by teachers across the world to bring early learning to life through music and movement. The book has been a particular hit in south-east Asia, where it is widely used to teach children English. “We are excited to give children the chance to watch the characters in The Animal Boogiebrought to life in a new way. Everyone who hears the song can’t help but get up and dance; with the video, we’d like to get even more families on their feet,” said Barefoot Books Co-founder and Editor-in-Chief, Tessa Strickland. The Animal Boogie is the second in a series of digital videos created by Barefoot Books. The first, Driving My Tractor, (http://www.barefootbooks.com/driving_my_tractor_video), sung by award-winning children’s performer Steve Songs, was launched in Autumn 2009 to wide acclaim. More popular Barefoot Books stories will be available in digital video format in the coming months. Ahmad Reza Ahmadi's fascinating short stories speak poetically about humanity, love, nature and peace for children and young adults. David Almond's works are deeply philosophical novels that appeal to children and adults alike, and encourage readers by his use of magic realism. Bartolomeu Campos de Queiros as an author of poetic prose and playful poetry is highly admired for his commitment to beauty and art. Lennart Hellsing is an outstanding poet, who shares the pleasure of language through his mastery of rhythm, word games and invented words. Louis Jensen is a powerful storyteller and entertainer who combines magic and reality. Jutta Bauer creates a harmony between the verbal and visual language, using a philosophical approach in her originality and creativity. Carll Cneut's amazing works powerfully narrate stories in his highly recognizable visual language. As a pioneer of modern picture books, Etienne Delessert's impact on many great illustrators around the world can be recognized. His blending of magic and realism, grotesque and close-ups, has created a distinctive style. Svjetlan Junakovic presents beautiful compositions that are expressive and emotional, while at the same time playful, imaginative and evocative. Roger Mello's world is a rich spectrum of techniques, imagination, colour and inspiration that is considered innovative, fascinating and intriguing. A full list of candidates can be found at www.ibby.org. The ten members of the 2010 Jury were led by Jury President Zohreh Ghaeni from Iran. They are: Ernest Bond (USA), Karen Coeman (Mexico), Nadia El Kholy (Egypt), Maria Jesus Gil (Spain), Jan Hansson (Sweden), Annemie Leysen (Belgium), Darja Mezi-Leskovar (Slovenia), Alicia Salvi (Argentina), Helene Schar (Switzerland) and Regina Zilberman (Brazil). Elda Nogueira from Brazil represented IBBY and Liz Page acted as Jury Secretary. 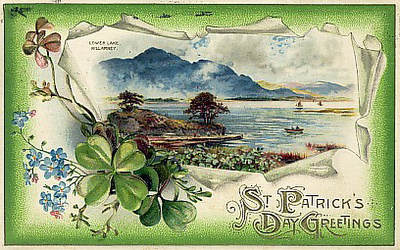 I grew up on an island in the Mediterranean where there were very few Irish people, or people of Irish decent for that matter, so (alas and alack) I did not really get to enjoy a St. Patrick's Day while I was growing up. After I left university I spent a summer in Dublin and grew very fond of the Irish people, their beautiful country, and their interesting history. I did not grow to love the damp Irish weather however. Then, when I moved to the U.S. I finally got to celebrate Saint Patrick's Day, getting into the swing of things by donning green clothes, drinking green beer, and even baking Irish soda bread. Since I started reviewing books I have come across a wonderful variety of children's books about Ireland and about St. Patrick's Day. You can look at the books I have reviewed in the Through the Looking Glass Saint Patrick's Day feature. There are a variety of books in the collection for readers of all kinds. 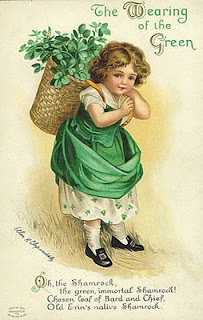 One in particular that I enjoyed was S is for Shamrock: An Ireland Alphabet. This is one of several alphabet books published by Sleeping Bear Press. It is the kind of book readers of almost any age - except the very young perhaps - can enjoy. Children (and adults) who read this book will find out many things about Ireland and about the Irish people. I found this book on my shelf this week and thought it would be a perfect fit both for Women's History Month and Youth Art Month. Enjoy! When Mary Cassatt was still a young girl, she very much wanted to be a painter. Her parents, wanting to encourage their artistically inclined daughter, arranged for Mary to have art lessons. Little did they realize that their daughter intended to make a career for herself as a painter. At this time, in the 1800’s, very few women were professional artists, and Mary had to be very persuasive to get her parents to let her go to art school. After attending art school in Philadelphia for two years, Mary began to pester her parents to let her go to Europe to continue her studies. Her father was against the idea, but Mary’s mother thought that Mary should be allowed to go, and Mary was able to travel around France, Spain, Italy, and Belgium studying the works of the old masters. Back in Paris, one of Mary’s paintings was chosen to be shown at the Salon, a very prestigious art show. The career she had dreamed about was beginning at last. This beautifully presented picture book not only tells the story of Mary Cassatt’s life, but it also shows young readers how Mary was influenced by the French painters that she met. Readers will discover how Mary came to love the impressionist style of painting, and how she developed a style that bridged the old styles of painting and the new. Throughout the book, there are reproductions of art works that were created by Mary Cassatt and her contemporaries. To help parents and teachers explain the Haiti tragedy to their children, Sylvan Dell has posted our Pandas’ Earthquake Escape eBook on our homepage free for the next 30 days. Our hearts go out to those suffering in Chile and in Haiti, and we hope having access to this e-book will help children understand the shifting plates and dynamic earth forces at work. We are proponents of using teaching moments, even tragic ones, to optimize learning. Listen to the news, read the picture book, use the 6-page non-fiction educational section in the back of the book, and then use the 50-page cross-curricular Teaching Activities section online. Please click here to access the free ebook, and thank you Sylvan Dell for this special book. In the U.S. today, a stark disparity exists between the reading abilities of low-income and higher-income children. Only 50% of low-income 4th graders read at or above the basic level according to the Department of Education’s 2007 Nation’s Report Card. The implications of the growing literacy gap extend beyond the walls of our homes and our classrooms. According to Dr. G. Reid Lyon, Chief of Child Development and Behavior at the National Institute of Health, "surveys of adolescents and young adults with criminal records indicate that at least half have reading difficulties, and in some states the size of prisons a decade in the future is predicted by fourth grade reading failure rates." According to the National Commission on Reading report, Becoming a Nation of Readers, “the single most important activity for building the knowledge required for eventual success in reading is reading aloud to children.” However, The Early Childhood Longitudinal Study found that only 36% of kindergarten students of a low socioeconomic status were being read to every day by their parents. In total, low-income children hear only half to one-third as many spoken words as children in more affluent households. By reading aloud with low-income children, we can help bridge the literacy gap. To accomplish this, we need a national campaign that emphasizes the importance of parents, teachers and community volunteers reading aloud to children at least 20 minutes a day from birth through high school. Similar to the national physical activity campaign that encourages kids to get their 60 minutes of physical activity every day, we need a similar campaign aimed at encouraging kids to get their 20 minutes of reading aloud every day. By reading aloud with children, we can improve their interest in and attitudes toward reading and improve children’s fundamental literacy skills, including reading comprehension, vocabulary, reading ability, listening comprehension, attention span and ability to articulate thoughts. Being read to by an adult also helps build a child’s self-esteem and confidence. A national “Read to Kids” campaign could engage national and local literacy organizations, schools, teachers, parents, authors, publishers and nearly every sector of business and society that understands that our nation's future depends on our children's literacy skills. Please vote to support this important campaign by clicking here. I am ashamed to say that I only just found out that March is Youth Art Month in the USA. I would have done a special feature on this special event much sooner if I had known about it. Sometimes trying to keep track of dozens of things at once does not always work, and I have to play catch up every so often. So, what is Youth Art Month anyway? Youth Art Month was founded by the Crayon, Water Color & Craft Institute, Inc., the predecessor of the Art & Creative Materials Institute, Inc. (ACMI), in cooperation with the National Art Education Association, in 1961 and was initially called Children's Art Month. Its goal was to "emphasize the value of participating in art for all children." It was renamed Youth Art Month in 1969, to include secondary school students. 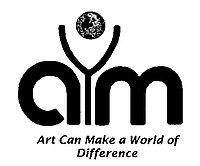 In 1984, ACMI created the Council for Art Education, Inc. (CFAE) to oversee the annual observation of Youth Art Month. As of 2009, CFAE consisted of representatives of: ACMI, the National Art Education Association, "The SHIP" (a group of manufacturers of art materials), and the General Federation of Women's Clubs. The Craft & Hobby Association is also involved in Youth Art Month. The main nation-wide component of Youth Art Month is a competition called School Flags Across America . . . Flying High. As part of the competition, each state Youth Art Month Chairperson selects a theme that is representative of that state and of the spirit of Youth Art Month, and students design flags around that theme. The winning design from each state is then made into an actual flag, and the 50 student-designed flags are then displayed throughout Washington, D.C. following an opening ceremony held the first week of March to commemorate the start of Youth Art Month. The winning students and their families are invited to attend this opening ceremony in Washington, D.C. and the flags are displayed throughout the city for March, and then displayed at the Youth Art Month booth at the annual convention of the National Art Education Association. Governors and mayors throughout the United States issue proclamations declaring March as Youth Art Month, and many United States Senators, Member of Congress, andstate legislators take the opportunity to make public statements in favor of art education. Observation of Youth Art Month is carried out by volunteers around the country, including art educators, parents, librarians, leaders of youth organizations, businesspeople, and students. special events, such as sidewalk chalk displays, ice sculpture carving, and craft workshops. For more information take a look at this booklet from the Council for Art Education. March is Women's History Month in the USA and I have collected some wonderful books to share with you. I would like to begin with a splendid book that is not only fascinating and beautifully written, but that is also really lovely to look at. When Annette Kellerman was still very young, her legs developed a weakness and she had great difficulty walking. To help his daughter to get strong again, Annette’s father taught her how to swim, and he encouraged her to swim as much as she could. It wasn’t long before Annette was swimming very well, and soon she started to win races and break records. Annette had grown up watching people dance in her parent’s home, and she had always wanted to be able to dance with grace herself. In the water, she found a way to do be “beautiful and graceful and fancy-free.” She “whirled and twirled. She dipped and danced and dived.” Annette had created something new – water ballet. This delightful true story is both interesting and inspiring. Young readers will come to appreciate the fact that the Annette Kellerman’s world was very different from the one that that we live in today. There were many things that girls were not allowed to do, and it took the courage of women like Annette to challenge the ‘rules’ that everyone lived by. Throughout the book Shana Corey’s unique text is perfectly complimented by Edwin Fotheringham’s vintage looking illustrations. Readers will find more information about Annette in an author’s note at the back of the book. You can find many more titles that are suitable for Women's History Month on the TTLG website here. LISTEN-ALONG STORYBOOK, a website and iTunes podcast, lets consumers download audiobooks of select Sterling picture books. It will delight children and bring backlist titles back into the spotlight. 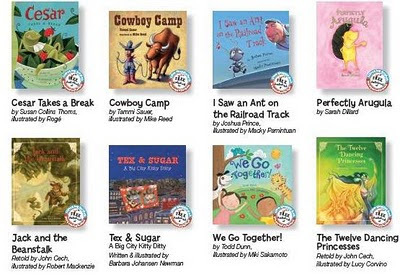 LISTEN-ALONG STORYBOOK rolls out with eight of our most popular titles. Every book in the program willl have a sticker directing readers to the website, www.listenalongstorybook.com, where they can get the free downloads or listen to them as streaming audio. You can sample one of the books, Cesar takes a break, by clicking here. You might also enjoy seeing how this title was turned into an audiobook. Here is a podcast about how the audiobook of Cesar takes a break was recorded. To view the podcast with a full screen double click on it. Here is my review of the print version of Cesar takes a break. Cesar is an iguana who was adopted by Ms. Lee and who now lives in a second-grade classroom at Pinebrook Elementary School. Cesar has a very comfortable life, and he thinks the world of his children, who happily tend to his every need. He often wonders “how this class every managed” before he arrived on the scene. With his help class time runs smoothly for everyone, and Cesar is understandably very proud of his abilities. Then the most dreadful thing happens! Cesar learns that he is going to be all alone for an entire week. School will be closed for Spring Break and Cesar is going to have to make do with being fed by Mr. Will, the school custodian. For a day or two Cesar mopes around feeling lonely and sorry for himself. Then, being an iguana who does let life get him down, Cesar decides that he too will have a break. He will take advantage of the Spring Break situation to explore the school at his leisure. Children will love sharing Cesar’s adventures as he makes friends, eats wonderful meals, explores new places, and discovers that he has even more talents than he thought he did. With a delightful and often very funny story and charming artwork, this is a picture book that children will love to share with others. Iguana fans will find a section at the back of book full of interesting facts about green iguanas. Send me an email and I will enter you in a drawing to win all eight of the books that are in the Listen Along Storybook program. Three of you will be lucky winners! These are the books that are included in the giveaway. The March and April edition of Through the Looking Glass Children's Book Reviews is now online. Please come and visit the site to see the new issue. For this issue I have chosen to do a special feature about saving the environment, in part in honor of Earth Day. Many children are passionate about doing their part to keep Mother Earth beautiful and green. They are often the driving force behind family recycling programs, and children all over the world have created and supported all kinds of environmental organizations and programs. The books in this feature will educate, inspire, and entertain young readers of all ages. April is also the month when many Americans celebrate Arbor Day. I have put together a delightful collection of books that are about trees. Some are informative nonfiction titles, while others are stories that will amuse, touch, and delight readers of all ages. Here in Oregon spring is making itself felt already, and for many people March and April are the months when they start getting busy in the garden. Spending time in the garden gives children a wonderful opportunity to connect with nature, watch things grow, and - of course - get dirty! In honor of National Poetry Month, I have reviewed several splendid poetry titles. One in particular is quite delightful. It is called A Mirror to Nature: Poems about Reflection with poems by Jane Yolen and photographs by Jason Stemple. This month's editor's choice title is Julie Andrews' Collection of Poems, Songs, and Lullabies. This is a splendid collection that readers of all ages will enjoy. Don't forget to look at the Bookish Calendar page for a lot more reviews about Harriet Tubman, Saint Patrick's Day, Thomas Jefferson, William Shakespeare, Leonardo da Vinci, and much more. At the beginning of this year I launched the new website, and all the new content for every issue is on this new website. However, a large part of the old content is still on the old site. You can still get to this content, but it is not intergrated into the new site. Moving the 4,000 reviews over is going to take some time, and I appreciate your patience while I work on this.